Your transaction receipt simply shows your proof of payment along with payment details. Sign up to use the LiensNC system or login w​ith your existing user credentials. 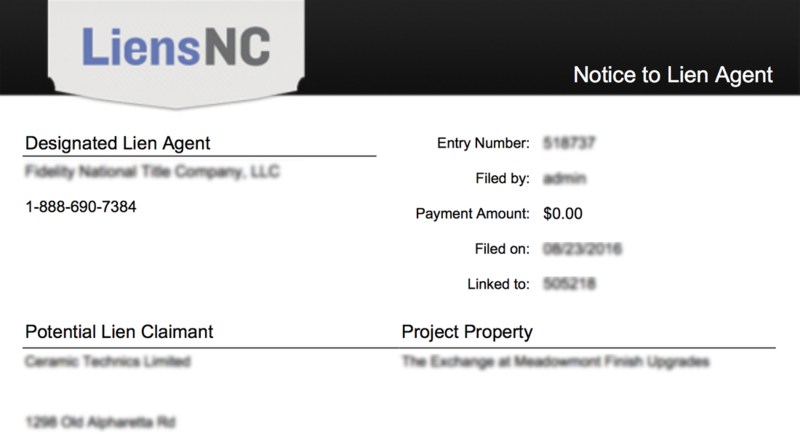 To print a copy of the transaction receipt immediately after making payment, you must be on the payment confirmation page (or have received an email receipt). To download the transaction receipt at a later date, you must locate the filing. As the final stage of payment confirmation, you will have an option to print your transaction receipt. Additionally when entering the customer billing information during the payment process, filers have an option to provide up to three Receipt Email Recipient email addresses so the LiensNC system can email a copy of the receipt. Click on the 'Download Receipt' icon in the Action column. Click on the filing's Entry Number and select the 'Download Receipt' button at the bottom of the page. ​The receipt will be downloaded in PDF format. NOTE: Only the filer has the option to download the transaction receipt.